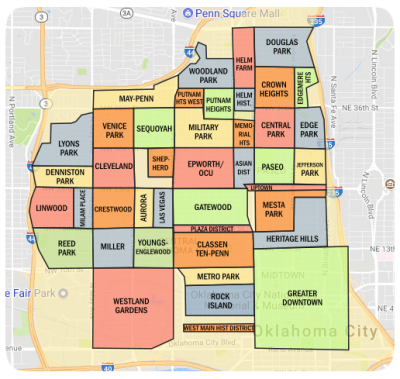 Affordable real estate in Oklahoma City, OK is a great start to a life of enrichment as you and your family immerse yourselves in the culture and heritage of Oklahoma. These homes are attractively priced and interest rates remain at all time low levels. This is an exceptional time to make a smart decision and take advantage of the buyer's market that exists today. Oklahoma City is home to the American Indian Cultural Center and Museum. This facility preserves and displays the rich heritage of the Native American people who inhabited the region for the past several thousand years. Demonstrations of tribal dance, language, music and traditions make the history very real and easy to absorb. Construction of the museum has been suspended. However, the center of town itself contains a plethora of exhibits and artifacts of interest. Red Earth Museum also promotes the heritage and lifestyle of the Native American through discovery of their arts. The museum sponsors an annual festival as well as a store that sells the fine arts created in the Native traditions. There are several other area heritage preserves and museums dedicated to the traditions and culture of Native Americans. The Chickasaw Bank Museum was once an actual tribal bank until 1902. The old bank has been refurbished and historical artifacts are now on display there. The Chickasaw Council House Museum is actually a modern museum that has been built around the first actual council house constructed on Indian Territory. Displays and exhibits include books, music, pottery, artifacts, beadwork and Chickasaw artwork. The museum gift shop is filled with amusing items related to Native American culture and art. For fun and excitement with a more contemporary flare, the Chickasaw Nation owns 17 area casinos. All the standard casino games are available and some casinos are open 24/7. The WinStar Golf Academy hosts training by instructors of world-class caliber at the 4,850 square foot facility. The WinStar Golf Course and WinStar World Casino are located only about a half a mile apart. These two area favorites attract locals and tourists from around the world. The resort-like environment of the golf course induces calm relaxation while the gaming fever of the 500,000 square foot casino incites tremendous excitement! For further relaxation, there is the Spa Habitat. This organic spa has received numerous awards for its special facials, scrubs and massages. Don’t let the high number of cheap Oklahoma City, OK homes fool you, these are some of the best values available in residential real estate and the resort-pampered lifestyle is evidence of just that. Finding a great place to eat is very simple in Oklahoma City, because the place is packed truly exceptional eateries serving up every imaginable cuisine and dish. You can find everything from American to Zuhai. The food is great, the service is great and the prices are wallet-friendly. You will find the date night upscale restaurants and the eat-on-the-go mom and pop cafes. Fast-food, casual dining and greasy spoon meals are plentiful in Oklahoma City as the most posh dinner delights. If the deserts leave you craving more sweet stuff, check out the Bedre Chocolate Factory. This 20,000 square foot facility produces an unbelievable variety of fine chocolates that can be purchased in the onsite store or through their website. Now is a great time to consider acquiring an affordable home in Oklahoma, OK. The investment you make today will only appreciate once the market rebounds. Right now you can purchase more house per buying dollar than has been possible in the last two or three decades. Act now while the property prices and interest rates are on your side. 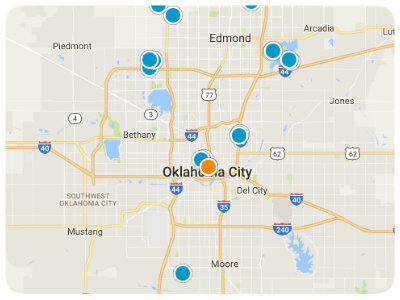 Oklahoma City is a wonderful place to live, work and play and you can find your reasonably priced dream home right here, today.